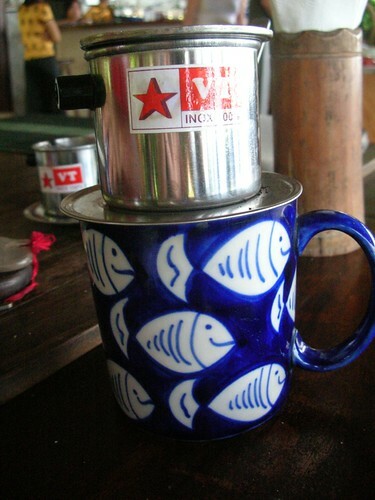 Posted in Vietnam, Wordless Wednesday | Comments Off on Coffee Please! 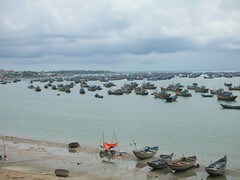 Mui Ne & Phan Thiet are fishing villages. Everyday we ate seafood at least once – fish bbq, seafood soup, fried squid, etc… (I’m drooling.) 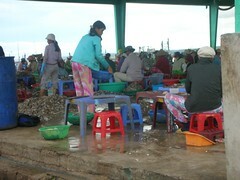 But the biggest export and most important local product is Nuoc Mam – fish sauce. 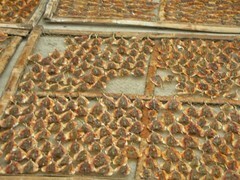 Sometimes you can smell it in the air – the odor of drying and fermenting fish. It really wasn’t as bad as I’d read it was going to be. The smell of fermenting fish might make you gag, but to me it smelled like the sea. And fish sauce is so yummy who cares what it smells like! 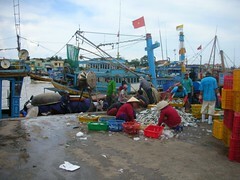 If you buy fish sauce, check the label, it might just be from Phan Thiet! 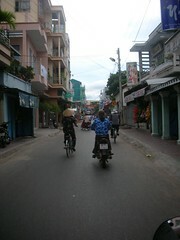 One day when there was no wind, we hired a motorbike and drove ourselves through Mui Ne Village and Phan Thiet City. 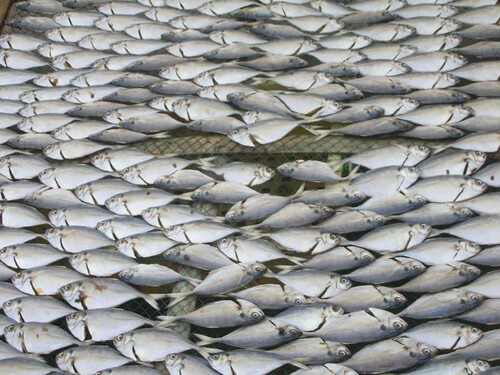 We saw a lot of drying fish. Contrary to what you might think, the fishing docks do not smell like fish. The fish here is fresh off the boats and fresh fish doesn’t smell. (Try saying that out loud three times.) 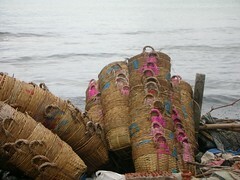 There was a flurry of activity here, with some workers unloading the fish from the boats, some loading the fish into crates, others separating the crated fish by type into piles, and some arranging the fish onto drying racks. 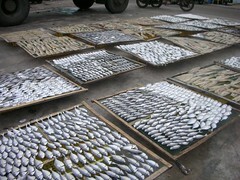 Some of the fish was packed with ice and carted off for shipping somewhere else. Further down the dock we came across a huge open pavilion where hundreds of people, mostly women, were cleaning and gutting thousands of small fish. And no, it didn’t smell there, either. We stopped to take a look for a few minutes when the DH spotted a food vendor. The DH is the king of street food. I’ve seen him eat more street food in more places than any non-local should. Once, I watched in horror as he ate barbecued mystery meat, cooked on a makeshift barbecue pit made from a tire rim, in the dark at 2 AM in San Jose, Costa Rica. That was before my street food adventure days really got started. He’s actually been sick only once in the entire eight years I’ve known him. This street food vendor was selling Ban My – baguette sandwiches filled with…well, we’re not sure, but they can have just about anything inside. We used to eat them in Toronto’s Chinatown. The Toronto version cost $1 and had a filling of something like bologna and cheese. The real version was incredible. It contained boiled egg, cilantro, fish?, and a spicy-vinegary sauce. Fishing is a way of life there, just as it is in thousands of cultures across the world. So what did I see? I saw people going about their lives just as people do the world over. And a lot of motorbikes! It’s not like I expected to see barb wire, mines and land scarred by napalm or agent orange (although evidently you can find that in the DMZ and other areas)… In fact, the only ones who think much about the war are the visiting American tourists. That’s right. For the Vietnamese, the war is pretty much behind them. And why wouldn’t they want to leave it in the past? They’ve got a bright future. 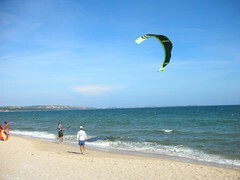 We chose to visit Phan Thiet and Mui Ne Beach not because it was the site of some fierce fighting in ’68** (rumor is there are still mines at nearby LZ Betty) but because Mui Ne Beach is one of the best sites in Southeast Asia for Kitesurfing. 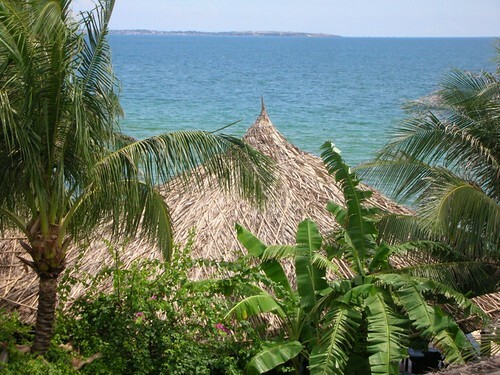 Mui Ne Beach is a very long, half moon shaped bay that receives a fairly consistent wind 45 degrees to the beach, which is perfect for wind sports like windsurfing and kitesurfing. 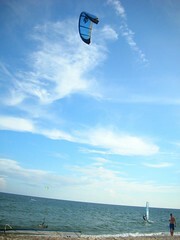 The wind is almost always good, except for the exact 12 days which we were there. Of course. We chose to visit during a sort of dead zone between the two big wind seasons. Who knew?! 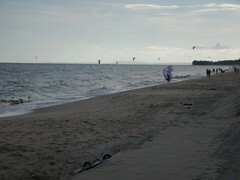 Nevertheless, there was enough wind a few days for the DH to learn kitesurfing techniques and skills, which are a little different from those used for kiteskiing on snow/ice. 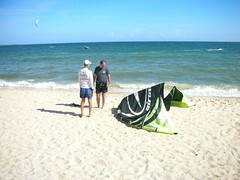 Ivan and Instructor Steve setting up the kite and getting it in the air. center and restaurant/beach front lounge. 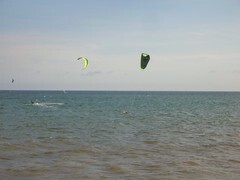 The view down the beach – a light kiting day. I’m currently working on a bibliography project, two 10 page research papers, a cataloging assignment and a 5 page librarian interview project. I figured it is the perfect time for some glorious procrastination, wherein I share with you my thoughts on my recent trip to Vietnam. Maybe it is a bit of a stretch for me to say “my recent trip to Vietnam”, since I only spent about 3 hours in Saigon and 12 days in one beach town. I should say “my recent trip to the Saigon airport and Mui Ne.” Obviously, I cannot make any sort of generalizations about the country or the people, since I saw so very little of the actual country. 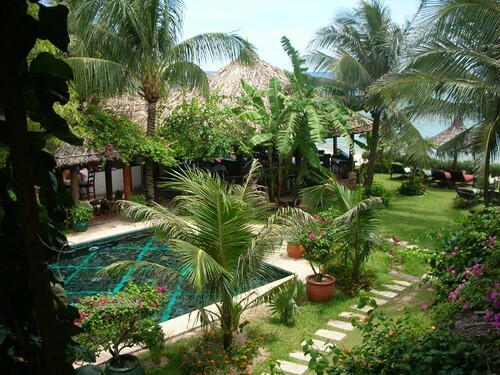 Still, I am absolutely certain that Vietnam is a place I would love to return to. The little that I did see I enjoyed. Some of my favorite books are In Country by Bobbie Ann Mason (which doesn’t actually have any scenes set in Vietnam, but features the daughter of a dead vet.) and The Things They Carried by Tim O’Brien which made Freshman American Lit class infinitely more interesting. People of my age were not even born during the war, but we grew up with all the war imagery. 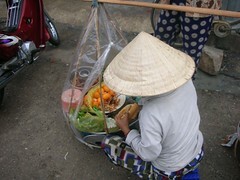 MS Word is calling me… More on Vietnam at my next work break! 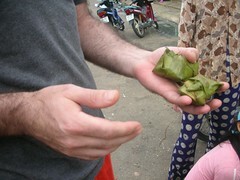 Read journalist Ron Gluckman’s reports on Vietnam, including war tourism. Just imagine it is a Sunday morning. You are drinking coffee, reading and preparing to spend the next four days in relative isolation, writing grad school papers. The phone rings. It is your husband. “Hey Heather, what are you doing?” he asks. You notice he seems strangely upbeat. He is at work on a Sunday, after all, he’s supposed to be bummed. “Just studying. What’s up?” you reply. 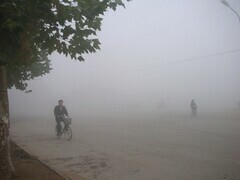 24 hours later you are on a plane from Shanghai to Ho Chi Minh City. Two backpacks packed. Rush visas in hand (just barely!). Tickets bought over the phone. A flight into Shanghai during a typhoon survived. Papers written on airplanes, in taxis and on trains. At 4AM you find yourselves in the Ho Chi Minh City airport. You thought you were unprepared for the trip to Cambodia last year, but now you realize you had everything planned to the last detail. Upon arrival to HCMC (hereafter Saigon, as most people refer to it anyway), you realize you have no guidebook, no phrasebook, no names of any hotels, no map of the city, nothing. 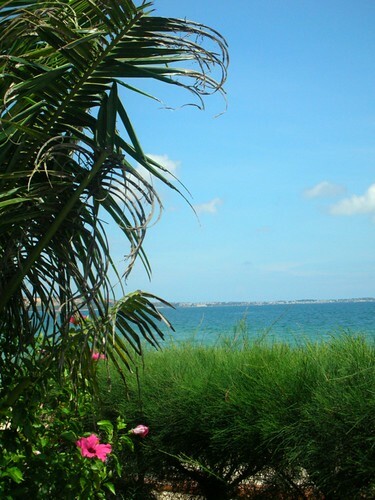 All you know is you want to go to Mui Ne beach and there might be a train there. At 12PM you are having lunch overlooking the ocean. You have to admit that it was really easy. Maybe there is no need to plan ahead? Maybe you should just throw the guidebooks out the window? How quickly two weeks pass! I’m back at work today, although my brain is still in Vietnam. I have another paper due tomorrow, so I won’t be back until all that pesky homework is done. As for the free wi-fi on vacation, it was indeed great, but I felt more drawn to the beach and the under-palm-tree-lounger than I did to updating the blog! Aaaaaahhhhh. It is so refreshing to be able to blog freely and surf the Internet without special proxies. It is so amazing to sit under a brilliant blue sky and chug fresh fruit juice. 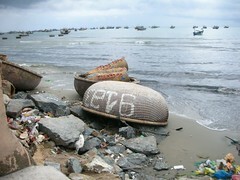 It is so cool to be blogging on the beach…in Vietnam. 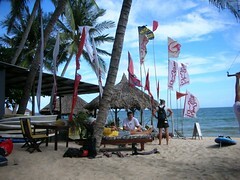 We are at Mui Ne beach, close to the small city of Phan Thiet, a few hundred kilometers north of Ho Chi Minh City. 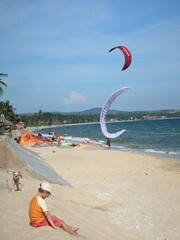 It is supposed to the kitesurfing capital of Vietnam, but so far the wind has been weak. 😦 No matter. The view is gorgeous. The food is delicious. The people are friendly. Do you remember where you were in 1975? I wasn’t even born yet! But if you were, do you remember the evacuation fights airlifting children and babies out of war torn Vietnam? Operation Babylift – a film by Tammy Nguyen Lee that tells the story of the operation and what became of the babies – the adopted children brought to America. The trailer alone had me in tears. And a book, After Sorrow Comes Joy, that tells the story from the perspective of the author – a young nurse and mother who went to Vietnam to assist in the orphanages and was intimately involved in the babylift operation, who herself adopted 3 children and went on to work in adoption in India and Vietnam. For those who lived through that era, or who want to know what it was like. Hat tip to Preya at Dreaming of Hanoi!